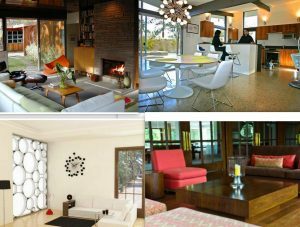 Interior Design Styles that you must Know!! At the start of any interior design project, we wonder in what style should we create our interior home in order to feel good in that environment. With an abundance of unique design styles, it is difficult to choose the style will work best for you. Classic Style is characterized by consistency, symmetry, rigor and elegance. It is thorough, correct and accurate till the last details. The main colors of the classic interior are noble and calm: beige, cream, gray, pearl, deep burgundy, gold, peach, silver, olive and terracotta. Classic does not accept shrill and sharpness, contrast and gross excesses. All colors should be soft and warm, creating peace and a cozy atmosphere in the interior. When choosing finishing materials the preference is given natural materials – marble, elegant art, best quality textiles. The main task of the classical style is to create a sense of celebration and elegance in the interior. Ancient columns, close curtains, lots of mirrors, vases and bronze statuettes are the basic interior decor. 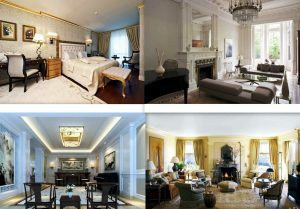 Neoclassical style is luxurious and elegant. It has reinterpreted the classic concept and architectural elements from different cultures, including Roman and Greek. 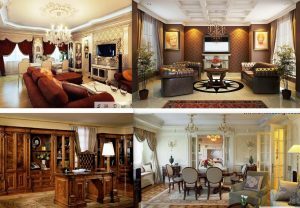 Neoclassical interior is known for its timeless elegance today. The colors in the neoclassical style are generally mild – cream, gray, blue, yellow and green. Luster black, red, gold and silver are used mainly as patches of color. The wallpaper flowers are combined with paintings on the wall and ceiling, to create a chic look. The furniture in the neoclassical style is simple but symmetrical. Typical are the dark wood furniture and beautiful ornaments, stone and marble floors, Persian carpets. The fabrics are luxurious but not ostentatious – damask silk, brocade, linen, velvet. Modern in interior design really refers to “Mid Century Modern”. It is recognizable by its clean, unadorned interiors. 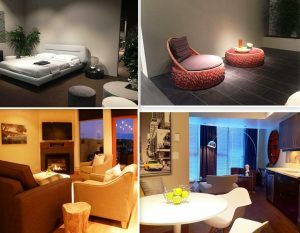 Use of natural materials such as wood, leather, teak and linen are prominent. Molded plywood and plastic is very popular in modern furniture, as well as polished metal. Furniture is very open and raised off the floor allowing for an airy feeling. Walls are often white adding to the expansive feeling. Modern interiors generally have bare floors and if area rugs are used, they are typically wool, and neutral in colour. Hints of colour were used in moderation. Changing and borrows pieces and styles from all different eras. It doesn’t have to be something that is “designed” right now – for example; furniture and art from the modern era are often used in contemporary design, and tradition mouldings and millwork are incorporated in many cases. The finishes would use a lot of natural elements such as fir or cedar and stone. The finishing details and furniture are in-ornate and use clean lines. Comfort and sustainability are key values that are important in a contemporary home. How to Pick the Right Hob for your Dream Kitchen!! Make your home Diwali Ready! !